The free cash flow calculation is one of the most important results from cash flow analysis that you, as a small business owner, can take away from the analysis of your company's Statement of Cash Flows. Below is a free cash flow example. 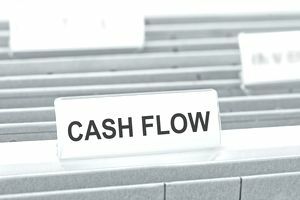 Simply put, free cash flow is the cash that a company has left after it pays for any capital expenditures it makes, like new plant or equipment. Some describe free cash flow as the money the company has left to pay investors after it meets all its financial obligations, but it is more complicated than that. Free cash flow as a part of cash flow analysis became important a few years ago when instances of company fraud started to pop up, such as the Enron scandal. The reason investors started looking toward the concept of free cash flow is that it was not as easy to manipulate as earnings per share or net income. Free cash flow tracks the money. It's what you have left over at the end of the year, or quarter, after you pay all your bills and pay for any new capital expenditures. It is what you have left over to pay investors. Free cash flow can be calculated in three different ways. All three are simple calculations. Here is one free cash flow example calculation. It is a very simple calculation and a part of cash flow analysis. where Net Cash Flow from Operations comes from the Statement of Cash Flows and an increase in capital expenditures comes from the balance sheet. If you look at free cash flow across several years of firm data and it is growing, that usually means that a growth in earnings is on the horizon for the firm. Firms with growing free cash flows are doing something, or many somethings, right. They may be enjoying growth in revenue. They may be efficiently managing their assets. They may be paying down their debt. They may be reducing their costs. If free cash flow is declining over a number of time periods, there may be dark clouds on the horizon for the company. Firms with declining free cash flow can expect a decline in earnings growth and worse. They may have to take on increasing levels of debt and may experience declining liquidity. Keep in mind that free cash flow is not completely immune to accounting trickery. There is not a regulatory standard set for it so there are a couple of different ways it can be calculated, though I have given you the most common way in this article. Items like accounts receivable and accounts payable can be manipulated regarding when payments are received, made, and recorded to make free cash flow look larger than it is. As a small business owner, free cash flow is a statistic you should calculate regularly. It will let you know how your company is doing and exactly how much cash you have to work with after all your bills are paid. It indicates if you can go ahead and expand your firm or if you should wait. XYZ Company, in the example, has a positive free cash flow. They need to analyze their financial position very carefully and find where their positions of financial strength are, as well as any positions of financial weaknesses, so they can continue to be a successful company.